Well, here's an unexpected consequence of the increasingly widespread acceptance of marijuana: Calls about pet poisoning from marijuana have seen a 30 percent increase over the past four years, according to the Animal Poison Control Center. Legalization of marijuana in some states appears to have led to (or just correlated with) more pets becoming sick from ingesting weed, and calls reporting poisoning have risen from 213 in 2009 to 320 in 2013. When it comes to cats and dogs, there are differences in the way each animal reacts to cannabis. 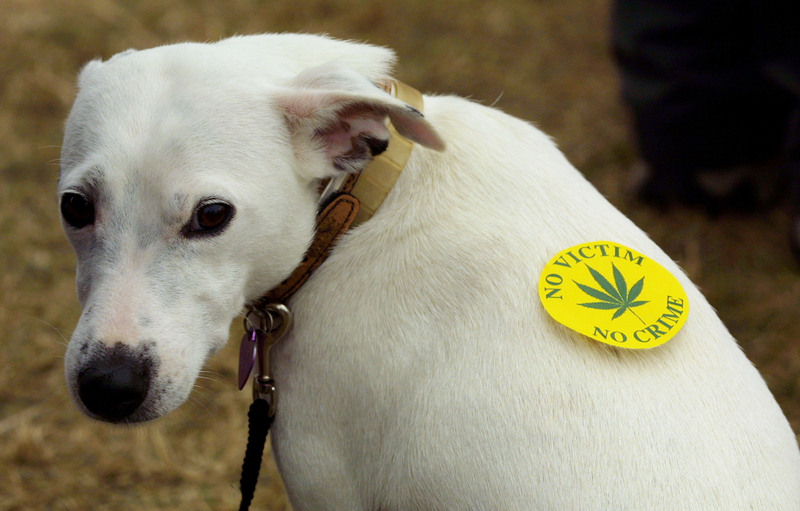 Dogs exposed to cannabis become incontinent, uneven on their feet, and can even go into a coma and die, veterinarian Dr. Monica Kaeble told NBC, adding that canines were more likely to go through their owners' supply. Cats can even be poisoned by second-hand smoke. Besides smoke, ever-delightful bong water is one way that pets can access the drug. The Pet Poison Helpline also lists hash brownies and cookies — which might contain already dog-harming ingredients like raisins and chocolate — as a way pets often get accidentally high. Marijuana butter is an especially harmful food. The list of signs to watch out for if you suspect a pet has marijuana poisoning — walking drunk and lethargy — reads like a bad night for human beings, let alone their pets. One of the reasons for the increase in calls could be the legalization of marijuana in certain states. NBC News reports that a link was found between a increase in dog poisoning and rise in number of people with medical marijuana cards; a fourfold increase in cases was reported at two Colorado hospitals in six years.